Located along 7th Ave. S.W., north of Valley View Centre. 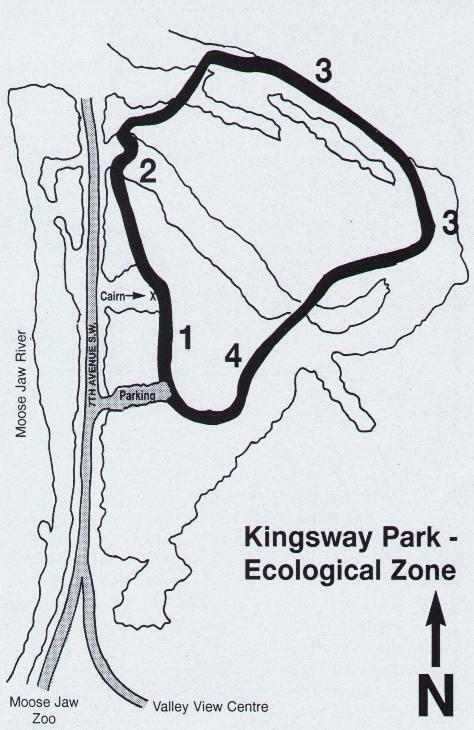 Welcome to the Kingsway Park Ecological Zone! The Ecological Zone, part of the Wakamow Valley, has been designated as a protected area to preserve its unique plant and animal communities. An 800 metre self-guided nature trail allows you to learn more about the area as you enjoy a leisurely walk through a variety of habitats. The Ecological Zone is a unique and diversified area of the Moose Jaw River valley. It encompasses harsh, dry, south-facing slopes, a moist marsh area, a grassy meadow and a woodland. It is home to 140 different plant species, used by over 100 bird species, 12 species of amphibians and reptiles and 20 animal species. It is also home to a variety of insects and plants which are not found for miles around.